Ace of Hearts, EO, Hoca and Biribi, English and Italian table games. They were all combined, and voilà – the modern version of roulette was created. Although roulette was a French invention, the game was banned in France. As a consequence, the French brothers François and Louis Blanc introduced the game in Germany and Monaco, creating the grounds for a gambling industry in the current gambling meccas of Bad Homburg and Monte Carlo. Roulette is surprisingly easy. There are not a lot of complicated rules. On the wheel, there are 37 numbers (0-36) and a ball of steel. Players in a physical casino typically gather around the table and place the bets. The croupier will then spin the wheel. After a short while, the wheel will slow down, making the ball start to fall. When the ball stops and hits a number, the players can instantly see who won the round. In an online casino, however, the functions are slightly more automated and things usually run a bit faster. Players who have experienced both, might still feel that many online casinos strive to maintain the authentic feeling of the roulette table you find in the real casinos of Las Vegas or Monte Carlo. Although the online versions are run by computers, you will still find a wheel on the screen, making it all the more authentic. 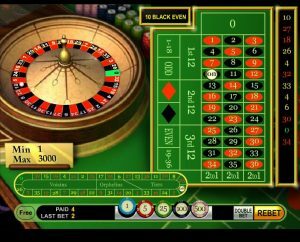 There are currently a wide range of online casinos offering roulette, but the most famous versions are probably European and American roulette. The main difference, is that the American version carries an extra space, known as the “00” space. The roulette wheel is divided into 37 or 38 parts, depending on the version of the game. You can do either inside or outside bets, depending on how much you’re willing to risk. For inside bets you can win 36 times the bet (original bet + 35 times bet), but the chances of winning are rather low. For outside bets, you increase your chances of winning compared to the inside bets, but the prize is significantly lower – only two times the initial stake. If the ball ends on the 0 however, the casino takes the entire pool. During the years, other versions of roulette have appeared, such as California Roulette. The traditional version of roulette is in fact banned in California, making way for a specific version tailor made for the Golden State. The major difference, is the use of cards. There is also a Vegas version, more commonly used in Nevada. Many online casinos now offer roulette on their mobile platform. It has never been easier to play on the go. With an online casino app or mobile browser version on your smart phone or tablet, you always have the roulette wheel in your pocket. Since most smart phones do not support Flash technology, online casinos do their best to develop trouble free solutions without relying on Flash, so that you can have the best mobile casino experience when spinning the wheel. Most online casinos offer some version of roulette, and for many people only a proper game of roulette can offer that authentic casino experience. A great thing about roulette, is that it can be played by any players, regardless of their previous gambling experience.